On the eve of a crucial evaluation of a year-old pilot programme, the Government of the Solomon Islands has endorsed the expansion of One Laptop per Child in the country. "We anticipate that the evaluation report will provide us with information to to determine the possibility of expanding the programme into more schools in the country," wrote the Hon Matthew Wale, Minister for Education and Human Resource Development, in an open letter to OLPC's Oceania director, Mr Michael Hutak. Minister Wale also announced his country's willingness to participate in the proposed "OLPC Pacific Pool", a standing stock of XO laptops which will feed Pacific deployments in some 14 Pacific nations which are testing OLPC's innovative approach in learning. Mr Wale also endorsed the efforts of the OLPC Technical Working Group to secure major donor funding for poor countries like the Solomons. Minister Wale presented the letter to Mr Hutak at a meeting in the capital Honiara. Mr Hutak had been visiting the country at the invitation of the Solomons' Honorary Consul in Australia, Trevor Garland AM. Mr Hutak's visit also included an audience with the Governor General, His Excellency Frank Kabui, and a site visit to the remote Western Province and the village of Patukae, one of three villages to conduct OLPC pilots. 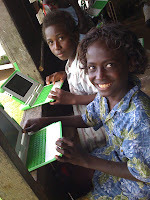 The Solomons is one of five countries to benefit from the donation of 5000 laptops by OLPC to the Pacific. The pilots were deployed by the Secretariat of the Pacific Community (SPC), which is OLPC's deployment partner in the Pacific. MORE INFO: email OLPC's Regional Director for Oceania, Michael Hutak, or phone +61 412 001 052.